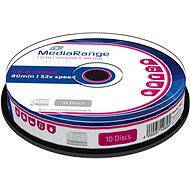 Reliable CD-R discs with a high-quality white finish that can be printed using an inkjet printer. 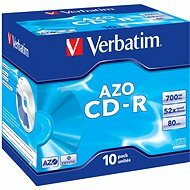 The disc can store up to 700MB of data and supports write speeds up to 52x. 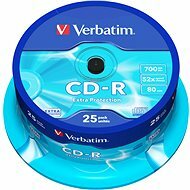 They are ideal for regular backups of music, photos, or data. The pack contains 25 discs in a cakebox. Capacity: 700MB / 80 min. For shipping to other EU countries visit this page MediaRange CD-R Inkjet Full Surface Printable 25pcs cakebox. Für Versand nach Deutschland, besuchen Sie bitte MediaRange CD-R Inkjet Full Surface Printable 25 Stk Cakebox. Chcete doručit zboží do Česka? 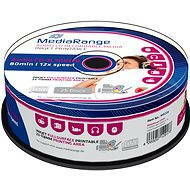 Prohlédněte si MediaRange CD-R Inkjet Fullsurface Printable 25ks cakebox. Chcete doručiť tovar na Slovensko? 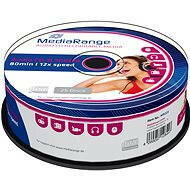 Prezrite si MediaRange CD-R Inkjet Fullsurface Printable 25ks cakebox. Für Versand nach Österreich, besuchen Sie bitte MediaRange CD-R Inkjet Full Surface Printable 25 Stk Cakebox. Magyarországra történő kiszállításért tekintse meg ezt a termékoldalt: MediaRange CD-R Inkjet Printable Fullsurface 25db cakebox.